The show is starting to take shape. 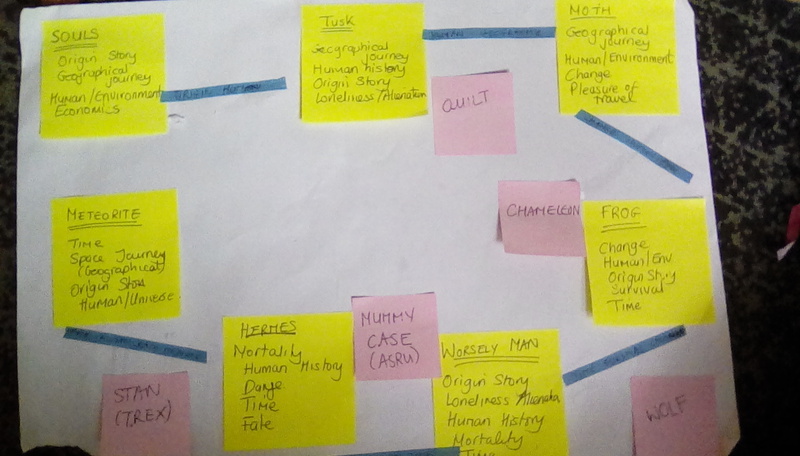 Here's the map of the poems showing the different themes and working out the transitions between each one. Between the six poems there are 5 opportunities for other objects. Beside the quilt these are taken from a museum project in which the children chose their top 10. The ones I've decided to use are: The Chameleon (who lives in Madagascar like the Golden Mantella) and who at the museum occupies the next door tank); the Wolf (who forms part of The Nature Discovery section which houses a fairy tale collection of animals - and a giant ant - to entice younger visitors) Stan the T. Rex, and a mummy case.